Self Portrait Tuesday, Identity Theme: Collector. If I were the blaming kind, I could trace all of this back to my grandmother. She's the one that got me started, long before I was even of speaking ability to have a say about it. She thought that since I was born in 1976, I would need a collection of 1976 memorabilia. Naturally. 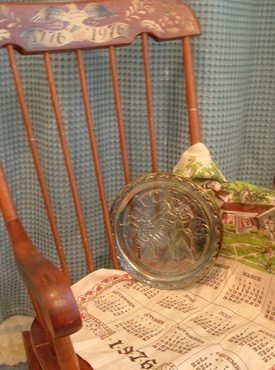 Above is just a tiny sampling--the rocking chair (I have the matching high chair too), cloth, and plate. But, oh my basement--it's got lots more. Plastic tablecloths, placemats, bottles... you name it, and I've got it with "1976" printed on it. When I was old enough to have a bit of a say, I took right over in the collecting realm. Visiting her often, we'd go antiquing and yard saling every day. And so, at the tender age of five, I started my first "collection" of my own. 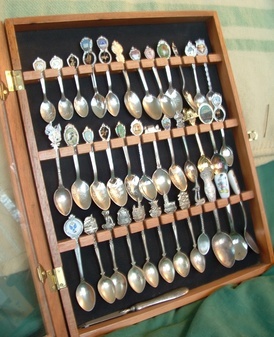 Spoons, of course. After that it was bavarian china (what an eight year old freak I was),then tea cups, and oh-so many other things. And anyone that's read this blog knows that it hasn't stopped. There's the chest full of linens, the pile of vintage aprons, my boxes of vintage patterns. Oy. It goes on and on. I know how crazy I sound. I suppose it's finally time that I admit I'm a "collector" (oohh--that word freaks me out). So what to do with all this stuff? Well, until I can figure out how to throw some of it out, I guess I'll just always need a big basement. And if my friend Kimberly is correct that the basement is the "soul" of the house, well, I'm royally screwed. Or my soul is cluttered. Or full of lovely things. Depending on how you look at it. More Self Portrait Tuesday bloggers here.